There are usually some leftovers when I cook. Not the meal very often but its components. For example, today I have about 4 cups of cubed and cooked potatoes in a tub in the refrigerator left from last week. They are running out of time. This seems like a place to start so I look around for other additions that will turn into a pot of something good. I always keep carrots, olive oil and spices around. In my dehydrated stores, mushrooms are a wonderful umami booster to any dish. There has been a leek in the crisper for a while the tops looking a little shabby. In the fridge also is some milk I must use up and a tub of sour cream with a couple of nice dollops that need to go away before it’s too late. Not sounding very glamorous is it? 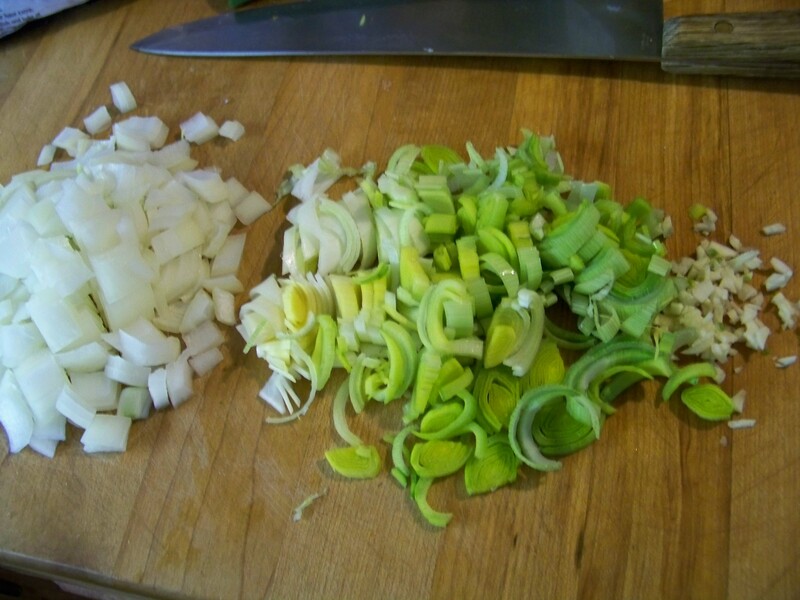 Clean, slice and sauté a leek (an onion will also do) in a couple of tablespoons of olive oil until soft and slightly golden on some pieces. Add the cooked potato cubes and go over them with a potato masher until coarsely but evenly mashed. Stir in about 5 cups milk (I had whole milk), add 2 teaspoons salt and 1/2 teaspoon black pepper. Also add spices you like. I used parsley flakes for a hint of greenery and coriander for a hot and lemony hit. A pinch of red pepper flakes adds nice heat if you like that. I do! This needs to be simmered until it bubbles a bit and while we wait for that use a carrot peeler and slice a medium carrot with it to make ultra thin slices. It whiles away the time it takes for the soup to bubble and adds beautiful color to the pot. Those dehydrated mushrooms I mentioned come into play here. 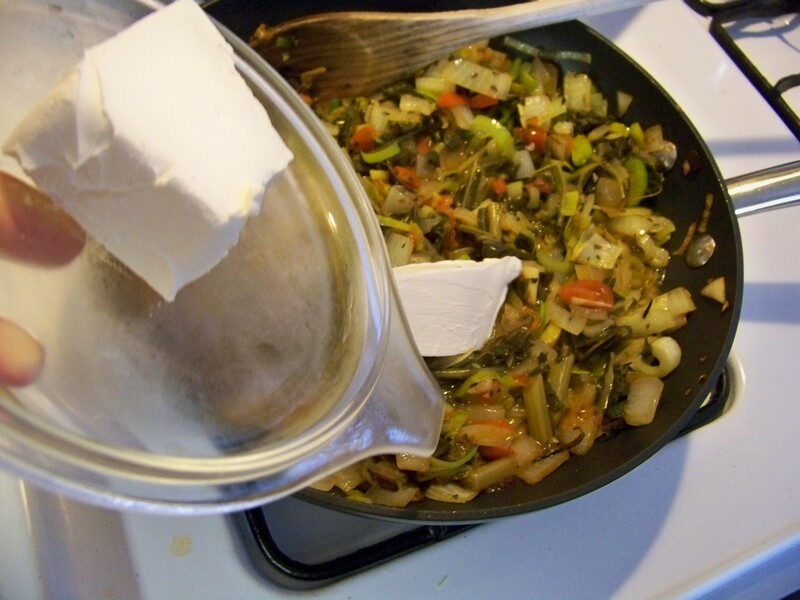 I grab a few slices and crush them in my hand and add the flakes to the pot. You can’t see them much but you sure will taste the mellow earthy goodness they impart. Once everything has a chance to simmer and blend flavors it’s time to add a bit more creaminess. It’s time to close off the flame so the dairy components won’t break and look grainy. Those dollops of sour cream are just the touch. If you happen to have some regular cream, a shot of that will add more richness. Just stir it and let it melt right in. As a final touch that adds that Je’ ne sais quoi (that’s how a diva says “I don’t know what”) a tablespoon of Parmesan cheese gives everything a sharper taste. Don’t add too much or the secret will be revealed. You want just enough to have people try to guess what that great (or grated) taste is. Another ingredient that does that in tiny amounts is nutmeg. Grate some fresh or go to your spice rack an add just a wee pinch. In the end our leftovers have never looked and tasted better. The refrigerator is slightly cleaner and the company at the dining room table are enjoying themselves better after raking leaves, working on the car and cleaning and cooking. I think after all this work we’ll have to dress up for a date night tonight. And that’s how we glam the leftovers. 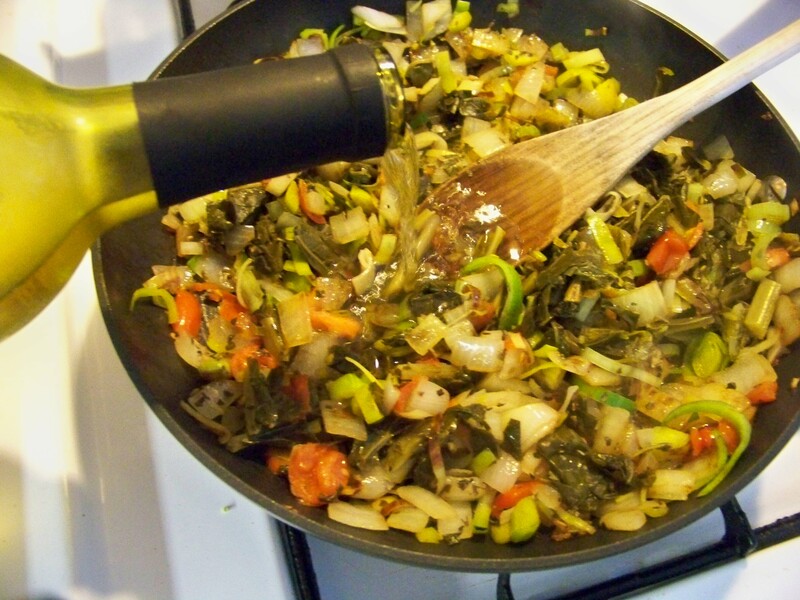 First saute the leeks and mushrooms in the olive oil until tender. Add the garlic and stir it in to bloom the flavor Add the broth, milk and cream and stir in the potato flakes. Stir in the remaining seasonings and let it simmer about 3 minutes. Now at least six of you can have a nice hearty bowl of soup to warm you up all over. 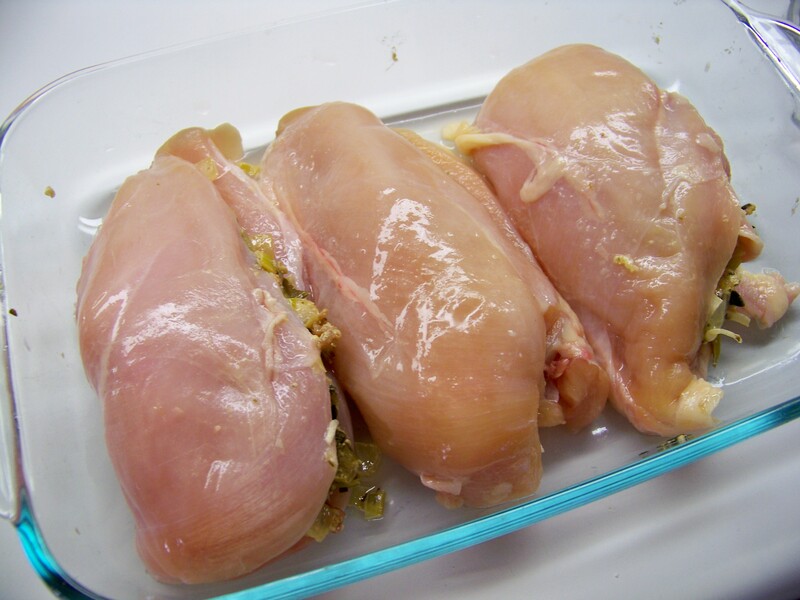 For extra hardiness you could add some left over chicken cut into cubes or add more pepper flakes to clear the sinuses during a nasty cold. This soup will provide relief and give you energy to muddle on through all that snow. For my 200th post I wanted to prepare something special. 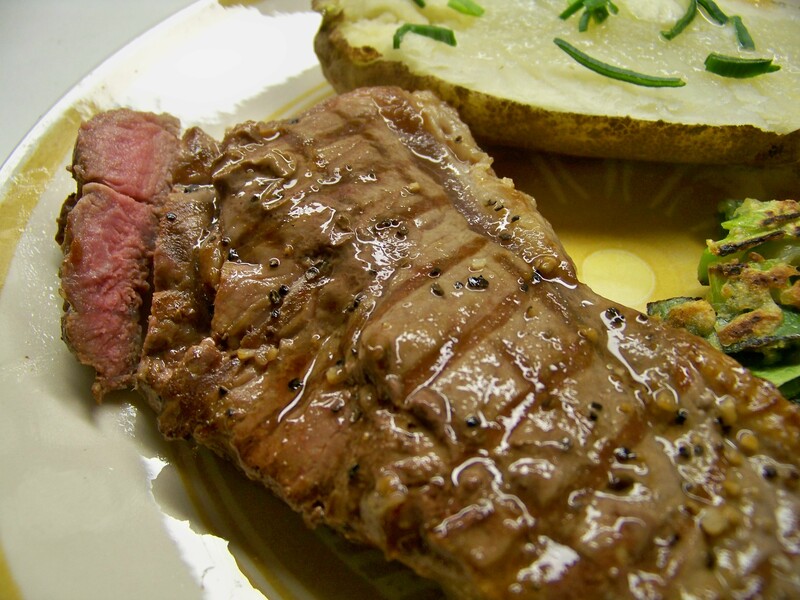 Special Suppers often center around a juicy steak. 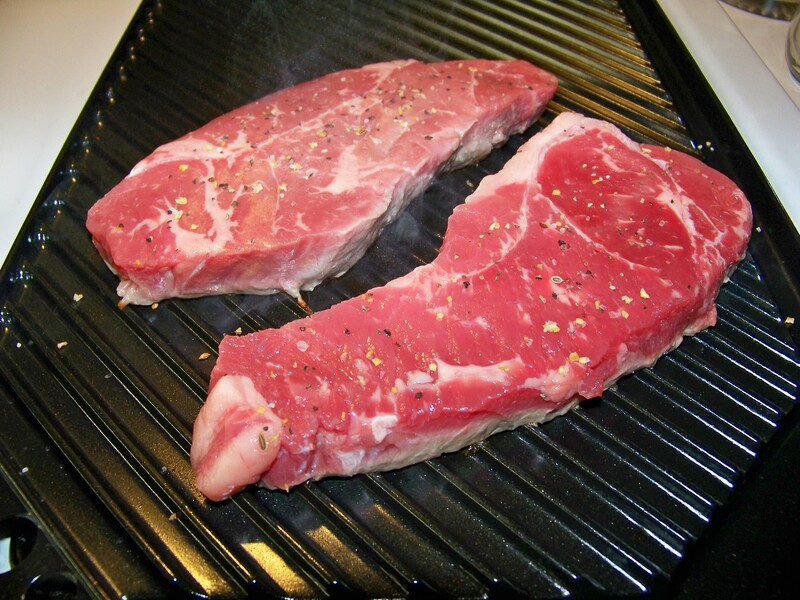 I found two strip steaks on sale at the store along with some leeks and nice big russet potatoes. 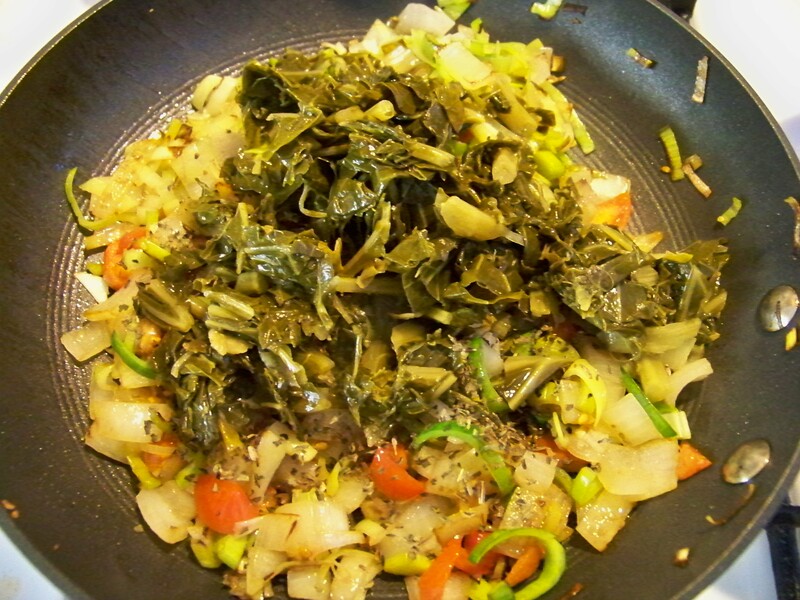 So meat, a green vegetable, and starch…what a perfect combination. In less than thirty minutes we were dining on the most sumptuous meal. I started by throwing the potatoes in the microwave. I knew that in about twelve minutes they would be done…they were pretty large. 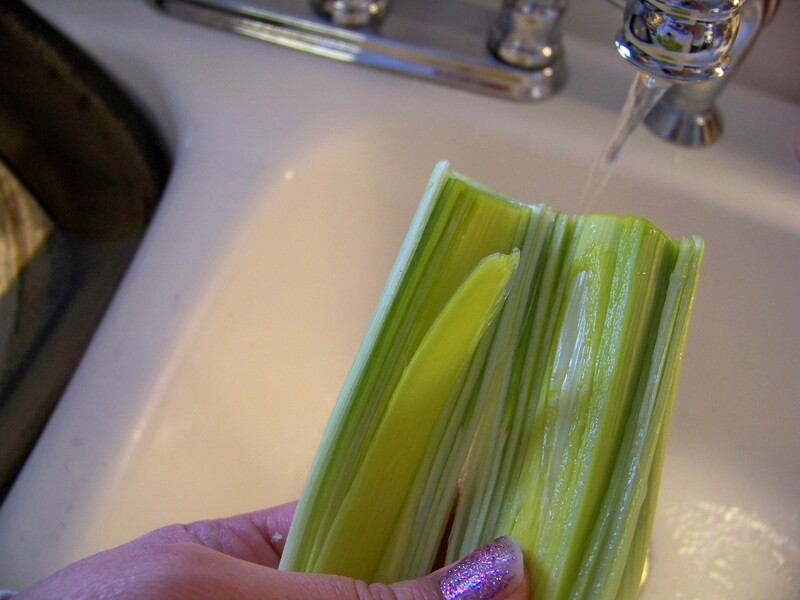 With those going I cut one of the leeks in half, washed the grit from between each leaf, and sliced them into quarter inch slices…maybe a little thinner. I put them in a bowl and sprinkled steak seasoning on them, parmesan cheese, about 1/3 cup flour, a heaping tablespoon of corn meal, (masa) and a dash or two of salt . 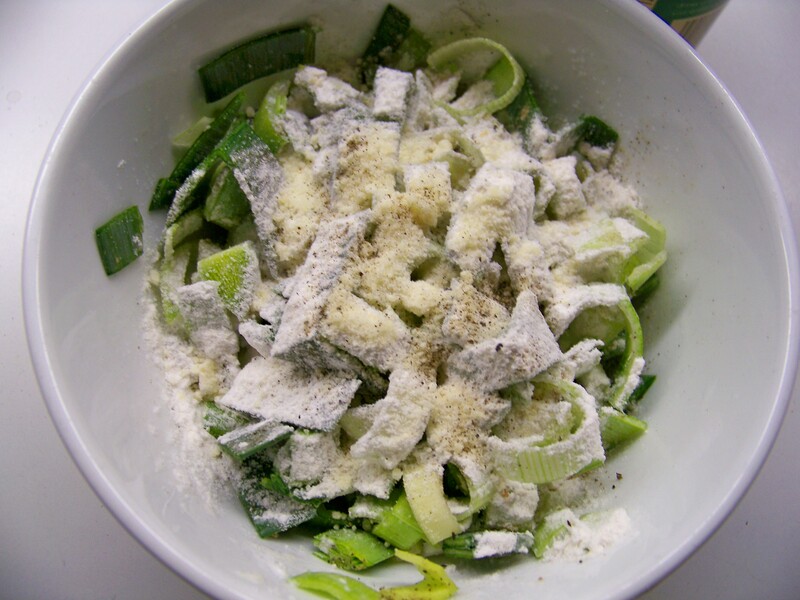 I added a good splash of water and mixed everything up until the leek slices were well separated and coated in a nice batter. I set this aside and attended to the steaks. All I needed to do with them was to season them with a steak seasoning blend, throw them on a hot grill, and watch them sizzle. 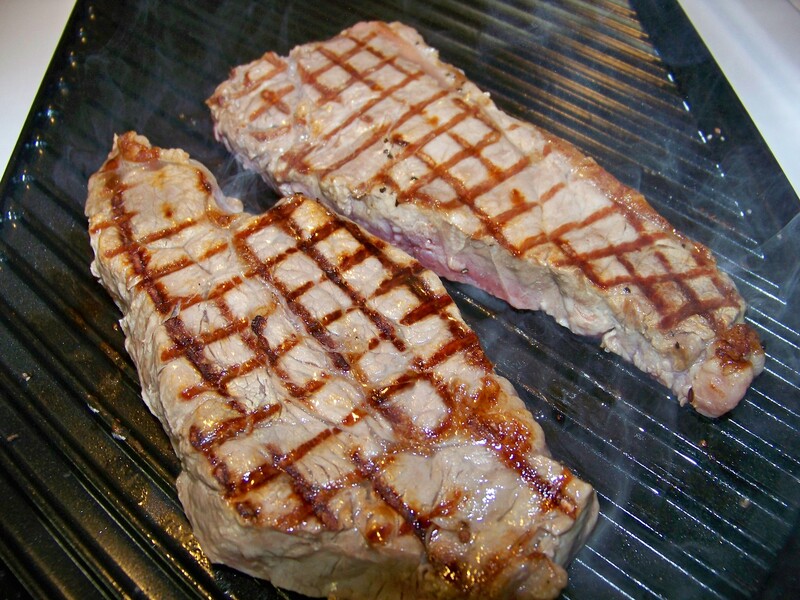 After about three minutes I gave them a quarter turn to make those lovely cross-hatched grill marks. I turned them over after a total of about four and a half minutes. The other side got the same exact treatment. When the potatoes were done, the steaks were nearly there as well. I got out the instant read thermometer and checked for a temp of 145°…the steak mid-rare. They needed to rest a while to insure that they would be tender and juicy in the end. I shut off the flame, covered them in foil, and let them rest right on the grill. 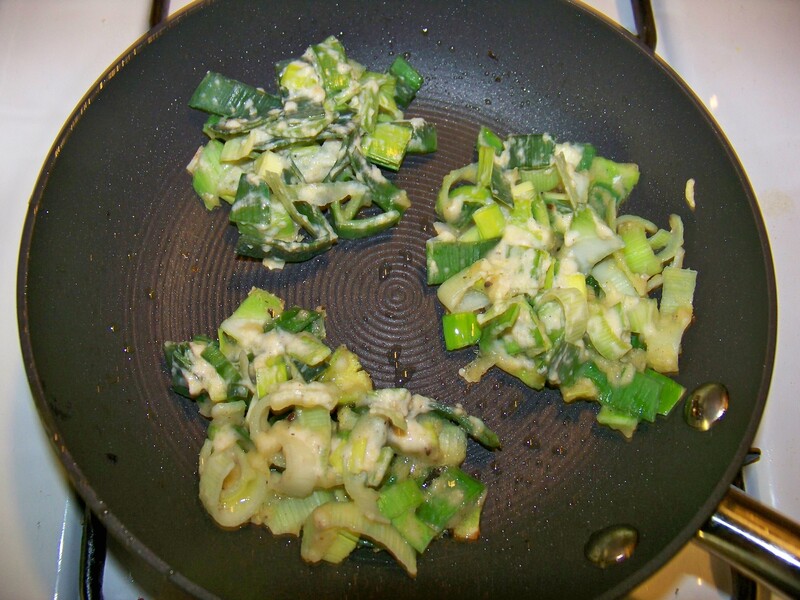 While the steaks rested I went back to my bowl of leeks in batter. 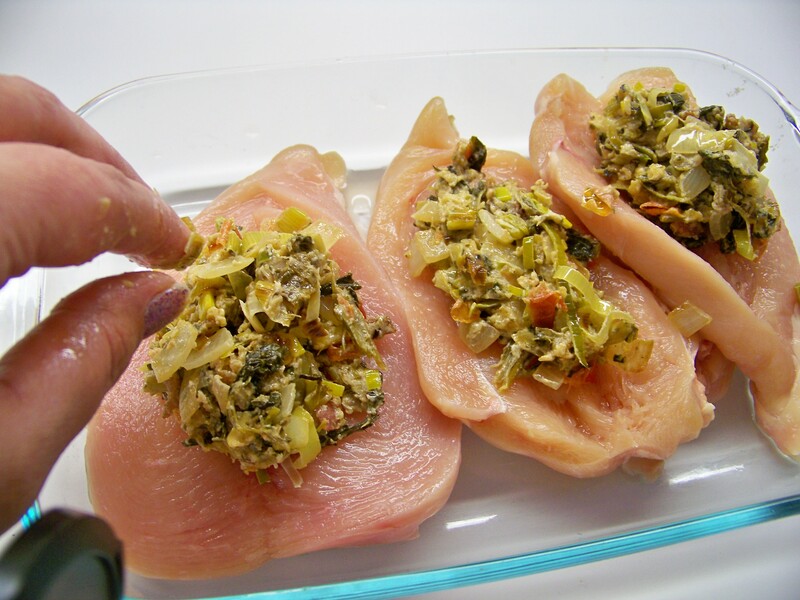 With the tongs I grabbed a good lump and placed them in a hot skillet with about a tablespoon of olive oil. When the edges began to brown, I carefully flipped them over to brown the other side. It worked! They stayed together in one cute little leek patty. I must give credit to a fellow foodie blogger by the name Frugal Feeding for these leek patties. 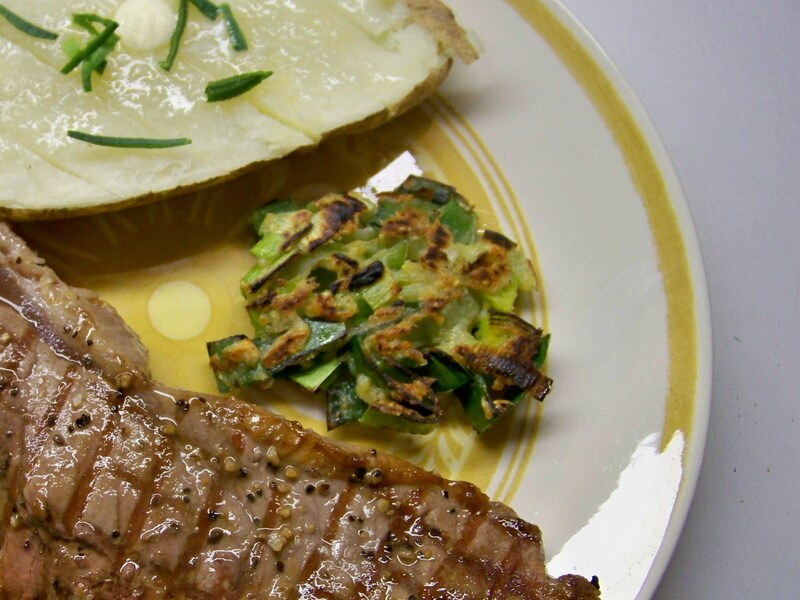 I’ve enjoyed this gentleman’s clever and very economical recipes for over a year. 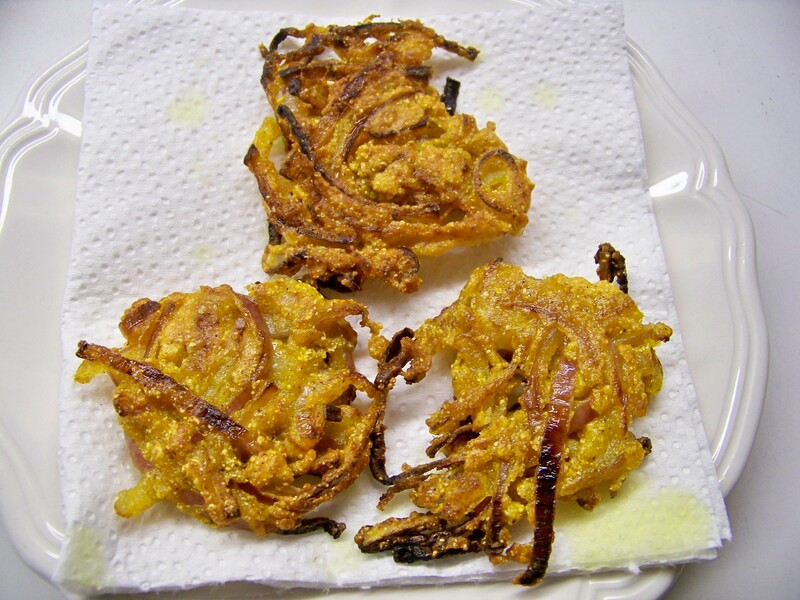 When I checked to see what he was cooking up today I found a gorgeous Indian inspired onion dish called bhajis. Nick, of Frugal Feeding made these with red and white onions and with a mixture of Indian spices and graham flour. I did experiment with Nick’s recipe for lunch and it was so good! With my bunch, I need to start out mildly before springing such grown up flavors upon them, so I decided to try this less exciting version for our supper…baby steps. They will be trying bhajis before long. 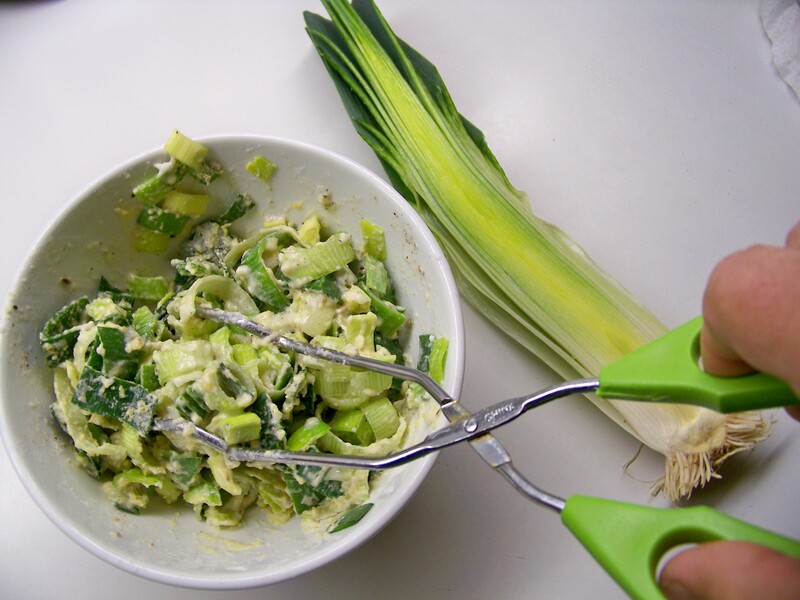 This evening, these leek patties were good, and a good start on getting my family to expand their horizons culturally…and believe me, serving leeks is a stretch. The poor girl at the market was struggling with how to charge me because she had never heard of such a vegetable. What a bubble in which we live…I wish to pop it! I assembled our plates. Julia and I split one steak and one of the big potatoes, and Jeff got a steak all to himself as well as a potato. He’s been working these double shifts lately and needs to fuel up a bit more than we ladies. Julia tried the leek patty but still found it a bit much on the onion, so I helped her finish. Jeff loved them as well as the steak and he showed promise that bhajis might just be on the “I’ll give it a try” list. My big kids would try anything but these two come from different genes…there are limits. I’ve learned after 200 posts that springing new things on them can more easily be done when a special dinner like this is involved. 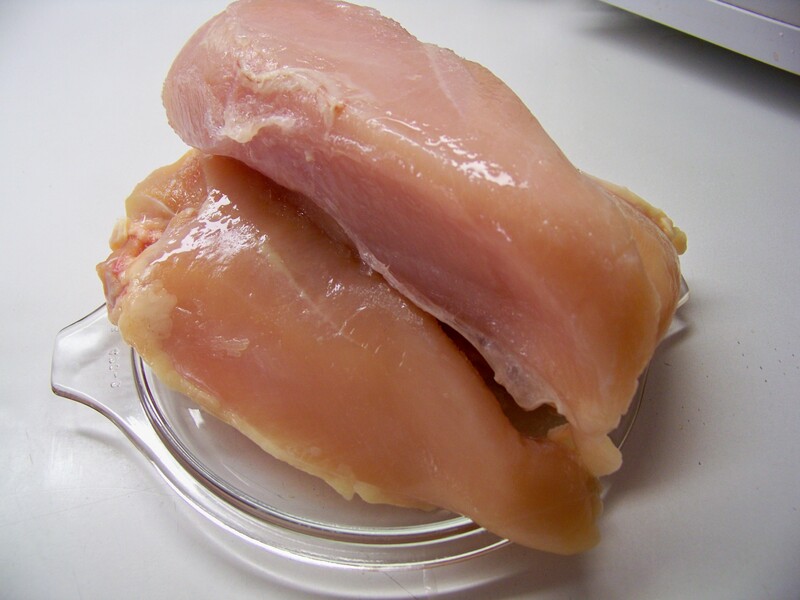 These breasts were pretty huge so I figured why not make them something even bigger! They needed to be stuffed then, and I surfed the pantry to find some stuff. A lonely can of collard greens caught my eye. Then some Peppridge Farm herbed stuffing seemed like it would be useful. Onions always make a good supporting role and for color and a little tang, some little tomatoes I had around were perfect. Bacon is always nice so I diced up the three slices I had in the refrigerator drawer. A little prep work was in order like browning the bacon, washing the leeks of the grit that hides in the leaves , chopping them, chopping the onions and the garlic. 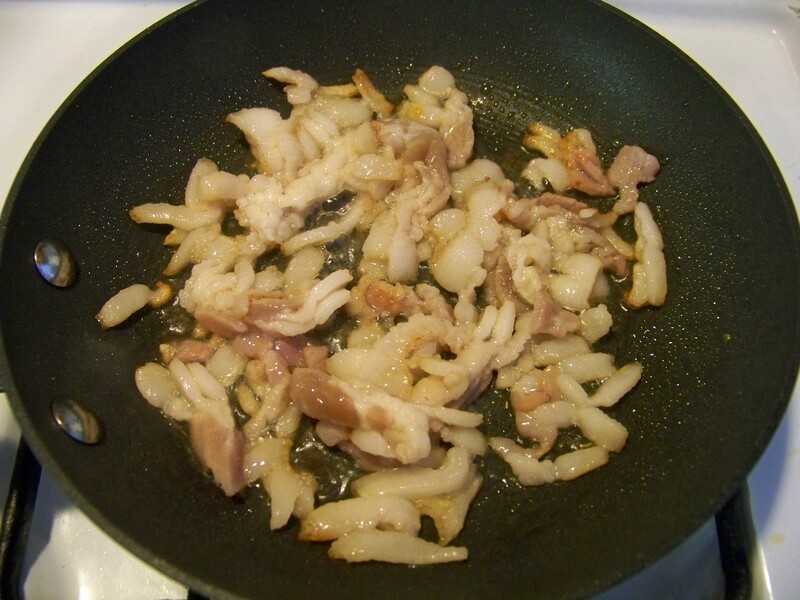 Now, everything is ready to toss on top of the bacon with its rendered fat. I let these things sizzle a while. 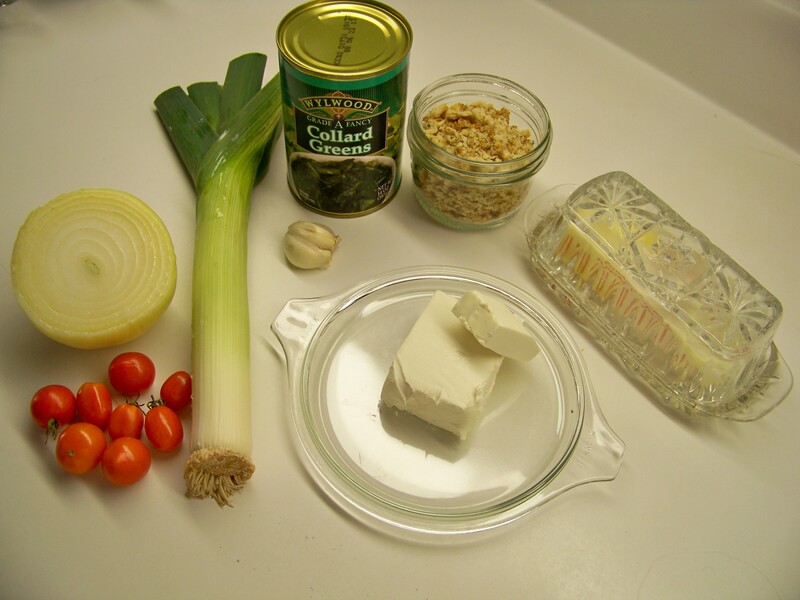 Once the onions turned clear and the leeks began to brown it was time to add the tomatoes and greens. Then a little chardonnay seemed like the thing to do. The bread crumbs and their herbs went in, and it started smelling really good. Last the cheese was added. This helped bind everything together. Some herbs like basil and thyme were sprinkled on, a little more wine to loosen things, and wow, what a rush of delicious smells! Now it was time to get to the chicken. I heated the oven to 350°. Laying them flat on a plate, I sliced them through the center to butterfly them open creating a pocket for the beautiful and tasty stuffing. They were now ready to bake. I gave them about 45 minutes before I checked the temperature. They were almost there but needed about 5 more minutes. 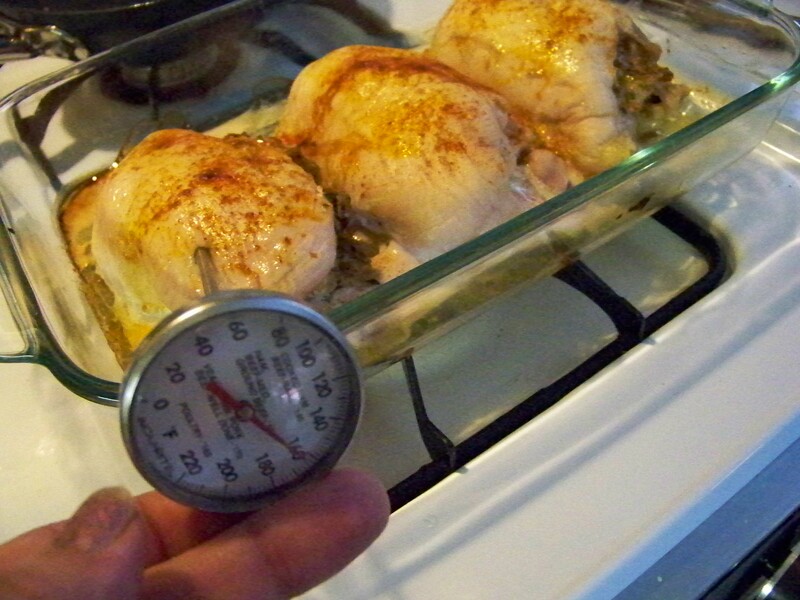 They also needed a baste with a pat of butter and a sprinkle of paprika. Next check was spot on. 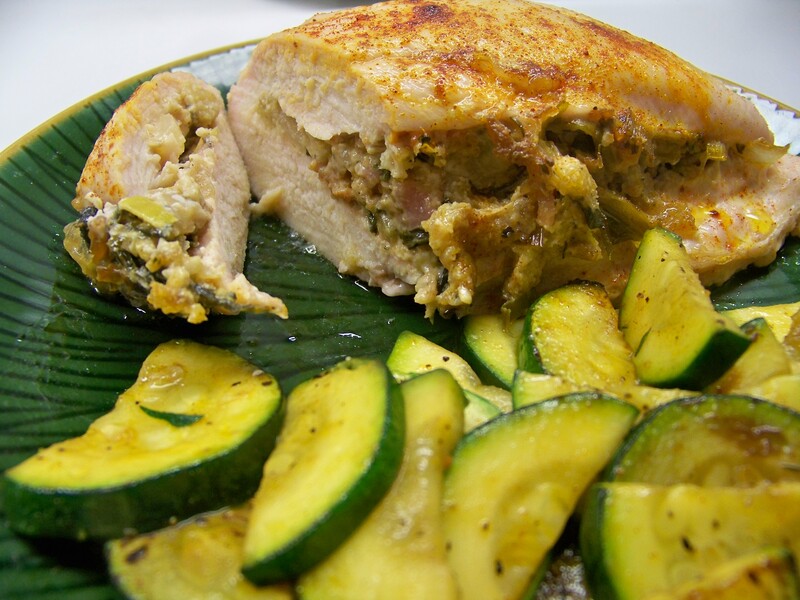 The rest period for the just cooked meat gave me just enough time to cook up a side of zucchini. 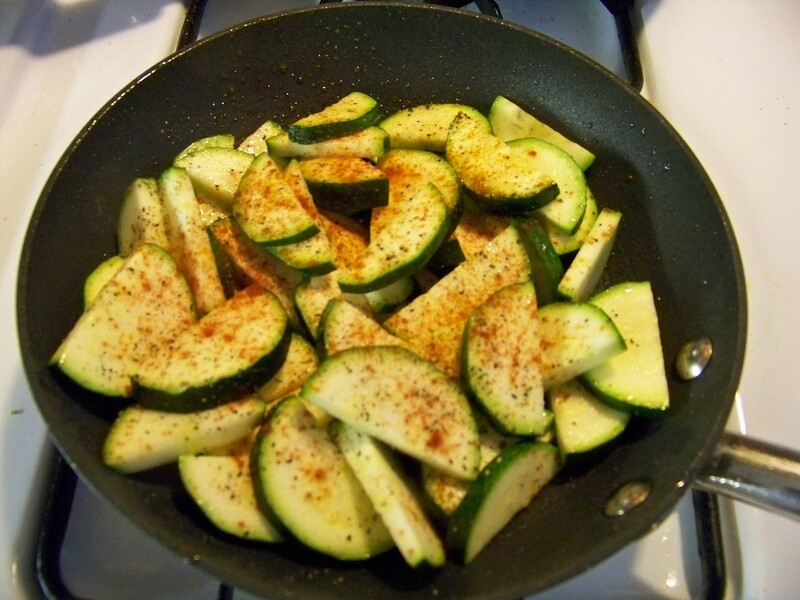 With a little olive oil heated in the skillet, I tossed in the zukes nicely sliced. On top I sprinkled some salt, pepper and paprika and let them cook to al-dente, not to al-mushy. The result was a fabulous supper! I didn’t have to call anyone to the table tonight. They were already there waiting to tuck in! I love that!